Freckle - fine light or dark brown with irregular outlines spots merging or, more often, located in isolation. Cause freckles are hereditary characteristics pigmentary exchange. Favourite localization freckles: nose, cheeks, forehead, rare upper limbs, back, chest. 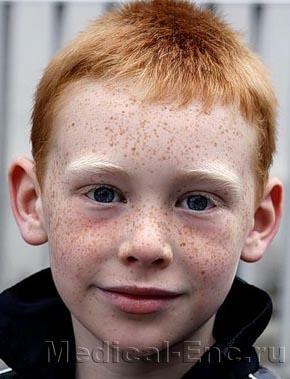 Freckles appear in childhood and adolescence, often from blondes and redheads. In the autumn-winter fade freckles, partially disappear in spring and summer, under the influence of solar rays appear again. The subjective feeling of not. How to get rid of freckles (funds management): exfoliating creams (10% of resorcin-salicylic-mercury, 5-10% white mercury), creams "Metamorphosis", "Herb", "Chromie is applied to clean skin for 30-40 minutes, after which it is removed, the procedure is repeated daily or every other day (10 times). Avoid too strong exfoliation, as it is in some cases increases pigmentation. Oseltamivir in spring and summer it is recommended to use sunscreen ointments with 10% salol, quinine (Saloli 5,0; Lanolini, 01. Helianthi AA 25,0) or 15% of para-aminobenzoic acid (CA. раraaminobenzoici 7,5; Lanolini, 01. Helianthi AA 25,0); cream "Ray" and others, which are thin in the face in the morning before going out on the street. Avoid sun exposure.